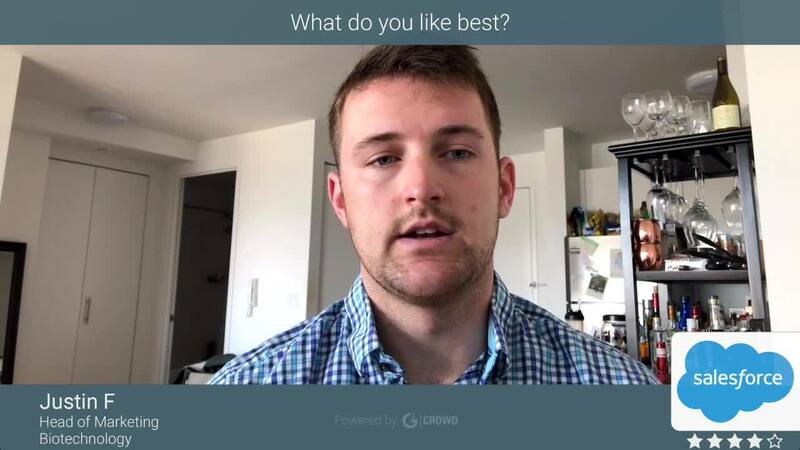 "It's a simple platform where we can align"
"We use it to send many emails every month"
"You may need a consultant for questions when getting started, but overall a pretty awesome tool"
"I thought Pardot was a real marketing automation tool." I still have to find something I like. I've used Eloqua and Hubspot in the past. I thought I was going backwards when I had to use Hubspot instead of Eloqua. That was until I got my hands on Pardot. Then I saw how behind Pardot is, even from Hubspot. Oh boy, where to start. You can't create landing pages on different domains/sub domains. Everything has to be masked. You can't do proper lead routing for non-users of the tool. Everywhere you look, there are weird limitations that I can't believe it's not there. If you are happy with something a bit better than a regular email marketing tool, this might be for you. If you are serious about marketing automation, be careful. Advance features will probably have to be handle by Salesforce itself. In my current role/company, there was no Marketing Automation, instead we were using tools like mailchimp. I guess if you have nothing and no background on other tools, you might be okay. Not my case. "Excellent Marketing Automation System with Salesforce Integration"
The Salesforce integration is awesome. We've designed a marketing automation program in Pardot and it helps us manage our Salesforce contacts. Letting our sales people focus on prospects that need the most attention. Our developers can create landing page and email templates that our sales team can easily use to populate content and send out. Even the least technical people in our organization can set up their own landing pages and email campaigns without any help. I feel like there are some customization options that are lacking. It would be nice to have the same level of control that you can have in Salesforce with Apex code. Pardot is continually making improvements to their user interface and system as a whole, so I think this will only continue to get better. A few times we've needed to upgrade our database storage and the turnaround time can sometimes take a few days up to a week. I would think this could be accomplished much quicker. If your organization uses Salesforce as its primary CRM, then Pardot should be at the top of your list if you're looking for a marketing automation tool. The ability to track activity on our websites and engagement with marketing programs at a prospect level. Tools like Google Analytics provide aggregate data, but Pardot lets us see individual prospect activity. The integration with Salesforce is invaluable to our organization. Also it gives a lot of power to our sales team to develop their own marketing programs including landing pages and emails. Overall Pardot is a good marketing tool. Compared to some more complex systems it is really simple to use and quite easy to setup and implement on your own with the really helpful step by step instructions. It's great because salesforce owns it so if you use the two systems, they are a great pair. My experience with Pardot is primarily along with Salesforce, so that's what my review will cover. While the integration with salesforce is easy to setup and manage, the big feature that is missing is that it won't auto update records when you pull a list and you can't even manually update the list. So for example, say I add an account field in salesforce for say account risk is High, Medium or Low and then I update that field in salesforce. I then want to add that field to Pardot. I can easily add that field to the sync but because I already updated it in salesforce if I create a list in Pardot, the record count will be 0 until I update every record AGAIN in salesforce. Same thing that happens if I have been using a field for 5 years in salesforce and now want to use it in Pardot for a list. Also another missing feature is the ability to report across systems. So if your sales people want to know which of their contacts are on a certain list you have to use an excel file from Pardot, you can't pull it within Salesforce. Reporting is also lacking in Pardot - it's hard to pull and parse data within Pardot, you often have to export data and use excel. Be sure to gather all your requirements. If you have complex business needs, it may not be the solution for you. However, if you want something fairly simple and easy to use it is pretty robust in a simple way if that makes sense. I would say it's a mid-level marketing tool and can handle most of the basics. Mass communication with clients and prospects. It is great because the price is great and it's easy to setup and get started using it. My marketing team likes it because of the ease of use. They use it for landing pages, adding forms to our website and communication with clients and prospects. "Implementation and UI leaves much to be desired. Poor email editor." There are some features such as automated emails and engagement studio which really have a lot of potential. Integration with Salesforce is a plus as it allows our Customer Service reps to easily add a current customer to drip emails and review emails. Tracking visitors and visitor scores works well. Implementation with Wordpress website forms has been fairly easy. Poor email editor with wonky controls and formatting issues. It's 2018, it shouldn't be this difficult to create beautiful emails. There doesn't seem to be any announcements for improvements to any features, especially email formatting. Perhaps a look at Constant Contacts new editor would help. Unable to add landing pages properly to existing sites. Way your options. There is much to be desired here. Creating automated engagement emails for things like customer reviews that CSR's are able to implement right in Salesforce has been a good way to drive up our google reviews. 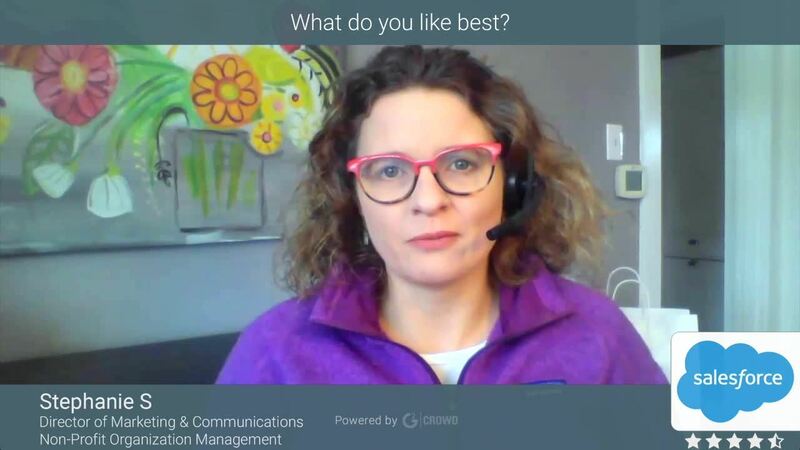 "The possibilities with Pardot and Salesforce are pretty hard to beat"
I love that you can tie into custom objects which is essentially opening up the API with the limited out of the box connectors Pardot has. This allows me to build automation with our entire Marketing Stack. As long as we can tie those things to Salesforce, I can use them in Pardot. I love the scoring categories and the ability to customize and adjust the scoring. I love the custom redirects and the ability to use those to track engagement on channels that are difficult to score, i.e. social, PR, online publications, etc. Roll-up of scores on the account level is fantastic. The limitations with landing pages are a little frustrating at times, but there are workarounds. I'd like to see a more robust framework for ABM. I'd like the lifecycle reports and stages to be custom (I want to decide why something and how something becomes an "MQL"). While it's super easy to use, the power behind the platform is even greater when you have respective roles digging into the tool. I.e. a developer building custom landing pages and email templates, a marketing automation specialist building the workflows and automation, etc. A person wearing all those hats is perfectly capable as well. 1. Ease of use - My entire team can use Pardot they don't have to be developers or engineers or even have too much experience with automation. It's easy to learn and easy to implement. 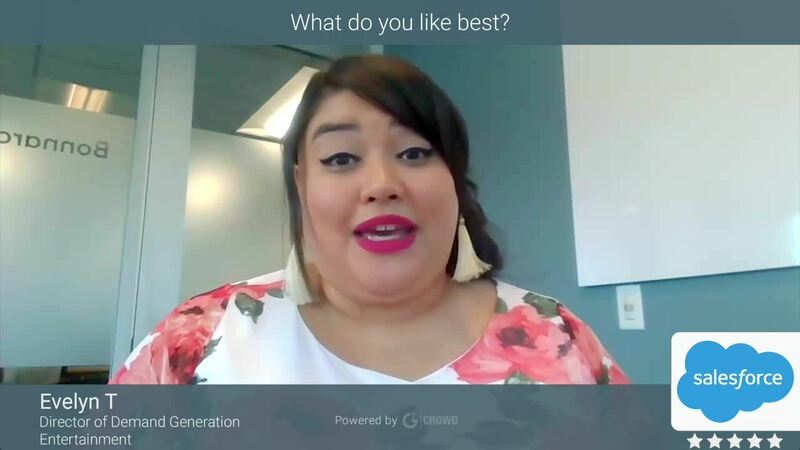 "Great features for marketing automation"
The multiple scoring categories, repeating nurture programs, and the new Connected Campaigns to get more reporting directly on the Campaign page, right in Salesforce where you need it. Adding the B2B Marketing Analytics tool to the mid- and top-level packages was a great move. That's the reporting power that my clients want today. And that tool runs on the Einstein engine, so it is the most powerful reporting available for Pardot. The initial pricing limiting you to 10k emailable prospects, and then needing to buy additional contact blocks. I would like more database seats available to start. Need more Landing Pages that a non-coder can customize. Other platforms have drag-and-drop style landing page builders, that is missing. Also A/B testing landing pages is not easy, when all changes must be coded with HTML in the templates. The features that Pardot has make it the best tool I have used for marketing. It integrates with Salesforce seamlessly, making your nurturing more powerful and your sales outreach more powerful. Content marketing is made easy with Pardot forms gating the content, Scoring Categories automatically detecting what my prospects are looking to buy from me, automatically feeding the prospects into Nurture programs with Engagement Studio, and tons of reporting along the way with Salesforce. All my emails are easily customized to my branding. Engagement Studio makes it easy to set up drip campaigns for our contacts. We can segment based on industry, department, time as a contact, etc. The UX of Engagement Studio is also user-friendly. I also like the automation rules because they allow you to use logic statements to apply actions to your contacts. It would be nice to have a carbon copy option when sending an email so I could include some emails of coworkers so I don't have to create a separate list and include their emails in that list. Pardot allows you to segment, automate, send drip campaigns, and more. The Support could be better, often they take a long time to respond and have to escalate the issue if you do not have Premium Support, but other than that Pardot makes our jobs easier. Segmentation, getting the right message to people at the right time. Being able to send emails to thousands of people and analyze engagement. "Good B2B Email Marketing Platform"
Pardot is a pretty easy to use platform for email marketing especially if you need to rely on its template designs for your emails. In fact, Pardot really excels in email marketing in terms of marketers being able to send out list emails or make templates available in Salesforce to users. Another area where Pardot excels is lead scoring and grading. It's pretty simple to get this setup in Pardot and makes changes in real-time. Although I wish it didn't automatically rescore everyone when you make a change and would only make this scoring change moving forward so I don't create a bunch of task notifications for my sales team for older leads every time I tweak the scoring requirements. Pardot also does a nice job with website activity tracking so you can easily see this information on a lead or contact record within Salesforce. This allows anyone in my organization with Salesforce access to know what content a lead or contact is accessing prior to a meeting. It's still really just an email marketing platform. While Pardot does offer some limited functionality for social posting, AdWords integration, etc. it's far from an one-stop digital marketing solution for B2B. I also wish Pardot and Engage were better integrated. While they're tied to each other from a functionality standpoint (you can't have Engage without Pardot), they look completely different and there are gaps in terms of what happens in Engage and whether or not it shows up accurately in reporting in Pardot. We use Pardot for our email marketing, lead scoring, lead grading, lead capture, and website behavior tracking primarily. "Pardot stands out above the rest!" Pardot makes it easy to see campaign responses, set up landing pages, launch email campaigns, and see results from various marketing objectives. The UI and menu structure is very straight forward and the user community is very active. After setting up templates, the creation of marketing assets is simple, I can launch a landing page in mins. Their ad personalization features involve some customization work, but I won't know the extent until we are finished rolling this out. I would like to see more native integrations into other marketing software like Engagio on the roadmap. Before purchasing a marketing automation software, think of all the possible scenarios you want to use it and see if Pardot addresses those use cases. We are using Pardot for full automation for all of our marketing activities, which include email, landing pages, campaign responses, and ABM. Pardot has taken our lead gen and storage, email automation, and entire marketing strategy to a whole new level. What I like best is the ability to make dynamic lists, based on a number of actions or data from users, that we then turn into specialized, automated emails. The userx for creating emails is archaic. I want to add a simple row and I need to edit the html code? Yikes. I need a little drag and drop on Pardot - or more, better templates - to be able to take full advantage of the dynamic lists and other amazing features. Hire someone who knows Pardot in and out as a consultant. We are solving the massive business problem of scaling up while still giving users an individualized experience. "Pardot has the tools needed in one place"
The platform is well integrated for email campaign management. It also has a strong community. Unfortunately the UI is dated. We also have to keep separate do not contact lists for GDPR instead of keeping them there. We can't link this to our Sendgrid, Gmail, or Outlook.com very well nor our LDAP directories. It lacks SAML and MFA for our single sign on. It would really be useful if it also could warm IP addresses for us. Be prepared with GDPR strategies and policies internally in your organization. Pardot is used for email list management so that we can get data in a more real-time manner. We tune our email management in such a way that we can gather decision factors more efficiently because of the Pardot tools. "Excellent Marketing Automation Platform for SMB"
Pardot offers powerful but easy to use features that cover all functionality you would expect in a MAP. Setup was well organized and straight forward. The system does not require dedicated resources to maintain and is easy to learn for new users. The Salesforce integration is not customizable and does not allow Pardot to overwrite Salesforce data. This causes problems when leads are re-engaged since we cannot update Lead Status from Pardot. The Drip Automation (e.g. flow for nurture campaigns) lacks several key segmentation criteria although several of these may be rolled out in the future. Best option in the SMB space. Our goal is to implement processes and technology that will easily scale as our business rapidly grows. The specific problems we were having with our previous systems were limited ability to segment contacts, limited criteria to score leads on, clunky integration with our CRM (Salesforce), limited visibility for sales to see prospect activity, and many smaller issues that were burning resources with manual processes. Pardot has solved all of these issues. Segmentation is now clean and automated. This also allows us to properly manage the volume of email being sent to prospects and ensure subscriptions are properly managed. We were able to integrate our product via the Pardot API to automate our trial registration and nurturing process and expand our lead scoring criteria to include activity that occurs within our app during a trial. Leads are also sent to Sales in an organized way and include full prospect activity data such as email opens, clicks, page views, asset views, etc. Pardot and Salesforce have also laid the foundation for advanced reporting so we can accurately calculate and segment campaign ROI. This also gives us the ability to accurately predict future revenue by tracking the entire revenue funnel in great detail. "Good software, but made unnecessarily complex by Salesforce.com"
The automation capabilities of Pardot are impressive and powerful. A company doing a lot of constant email and digital marketing will benefit from the automation, especially. The automation part is the key. Do not decide on Pardot if all you're going to do is simple email marketing. Pardot is for setting up whole programs of automated interactions, including follow-ups, and actions and tracking in Salesforce. Integration with Salesforce is kludged; terminology mismatches cause confusion; syncing with Salesforce is by no means seamless. And at $1000 a month, it is way overpriced. It's a shame, too, because Pardot itself is not bad at all. It's the Salesforce part of the equation that is frustrating. This isn't one of those software solutions you can purchase, open up, poke around, and just start using. You have to hire a consultant to set it up for you, and when you do, make darn sure you do your homework up front to state exactly what you want them to do and what the outcome should be. Otherwise, you'll be paying extra for development time on things they're telling you is out of scope, but was something Salesforce promised in the first place. Take a deep dive into your goals for digital marketing before investing in this product. Pardot may be overkill for many companies. Was convinced by Salesforce to go with Pardot instead of Salesforce Marketing Cloud when we rolled out Salesforce to our sales team. Wishing now we had stuck with ExactTarget. "Just starting to get the support it needs from Salesforce." It's a relatively simple setup process. As with many things Salesforce, if you can leverage an accelerator to get you up to speed with business practices, do so. Front end is click to create. I do like the way it can update existing records in Salesforce with Form Handlers when harvesting webleads, really cuts down on duplicates and gives you that 360 degree picture. This is more to do with Salesforce than Pardot. The connector walks all across your records and will often present "your record was being edited by another user" messages when you users try to save. This means they have to rekey everything they have done in that transaction. You can request from Pardot admin that your sync frequency is lowered. Distinct emails. It is really recommended that you have a solid deduplication tool in effect as a single email address is used as a UID. It really struggles with people who have sales@admin.com generic email addresses. Pardot is improving. It had a significant showing at the 2017 world tour, so check out the videos. If working with a third party to install, do ensure that they are education you on best practice and not just agreeing to your demands to sync a huge amount of data between systems unnecessarily. It has replaced Wired Marketing as our comms tool. It is lightyears ahead of that as the integration is significantly better. The aforementioned form handlers has made web to lead processes much better. "You can't go wrong with Pardot, but it has some growing to do"
Pardot's syncing capabilities between itself and Salesforce are excellent - especially since you get to choose exactly what you want synced and when, and which platform you consider to be the source of truth - either Pardot or Salesforce. What's crazy is that you can get down to the field-level - something I really appreciate. I actually love the way Pardot thinks about scoring and grading - primarily because we're able to adapt it to exactly what we need. We leverage the best combination of data enrichment and Pardot's own features (automation rules!!) to create extremely accurate grades. Many people will bust Pardot for kind of being a dinosaur, but honestly, it's all about how you approach and implement it. We're a data integrations company, and I can tell you from experience that the Pardot API is *very* limiting. This means the types of data syncing / updates to Pardot we can perform are limited - which means getting the most out of Pardot is tough. Luckily, we're able to bypass most of this through Salesforce. The automation campaigns do have some room to grow - they're not as smart / adaptable as, say, Mailchimp's automation programs. They've made some strides recently to improve them (i.e. showing you the exact dates the emails will be sent in a nurture campaign), but it's certainly not perfect for drip emails. Reporting inside of Pardot is by far its worst feature. You'll definitely have to look to Salesforce for this capability (in which case, if it's your source of truth, this makes the most sense). 1. Does your tech stack support this tool? 2. Will your teams adopt it? 3. Does it meet your feature requirements? 4. Does it help you get closer to your goals over alternatives? And also like any tool, it totally depends on how you implement it and how you use it. Bad marketing is still bad marketing - no matter what you're using. When it comes to measuring qualified leads, lead generation, and opportunity pipeline generated by marketing, Pardot is excellent for managing your campaigns, lead flows, and demand generation activities. My marketing team is small, but it was imperative that we had a tool that could pull together the customer and prospect experience from a digital perspective - more than say, a Mailchimp. Overall, Pardot fits best into our stack and with our team and Marketing's needs. "Love Pardot, but it has its flaws"
The ability to sync activities from Pardot and our website to Salesforce. As well being able to set up automation rules and programs that help take out our 'human' errors. So, when it comes to somebody submitting a request for quote on our website, we have an automation rule based of geography that will auto-assign to the correct rep. Because of this, we take out the middle man that had to look at it and determine who to send it to. And when it comes to our web request, timing is everything because our leads have said several times that they submitted that request to 2 of our competitors. We are almost always the first to react. I can't schedule exact times I want an email blast to go out. Example: I can schedule it to go out on Tuesday between 10AM - 4PM, but I can schedule it to go out at like 10:25 AM. They also tend to have several issues a month, like emails being delayed. It's not a real big issue, but when you're impatient like me it'll drive you crazy. Speeding up our process, especially when it comes to being the first to respond to all of our web requests. We also have become a much smarter company as we can now track what each lead or customer is doing in regards to the emails we send them and what pages they view on our website (as long as we have a tracker on them). This is a really big thing for us as we have 5 separate product categories, and many of our leads could go for any of the product types. "Difficult to Navigate - Good Opportunities"
I like the ability to manipulate prospects and rules through automation. Integrations with other apps work well and function at a high level. The integration with Salesforce is the best feature by far, having my leads update from all my marketing efforts is flawless. The platform is difficult to navigate. Unless you are fully acquainted with the program it is almost impossible to find certain items. Things are hidden within other categories and the search doesn't allow you to find anything aside from salesforce items. The engagement studio has some hiccups that I would like to see improved on in the future. I currently cannot copy steps and I am wondering why? The recycle bin has been an ongoing issue. I have watched more than enough tutorials to now know I have to clear the bin in order to re-add certain plug-ins. Customer service is somewhat of a joke Finding answers takes longer than just navigating with trial and error. Upgrade to get customer service. They no longer offer chat so getting in touch to get an answer in real time is almost impossible. . The engagement studio has perks and allows me to run campaigns with smart triggers. I am solving a lot of list issues with sorting and grading. The integration with Salesforce is the major benefit over other marketing automation platforms. Engage is a great feature and the engagement studio is useful to visualize campaigns. The landing page builder is horrible and lacks customization (although you can use HTML, your reporting will become limited). I have often experienced delays when testing and sending emails. Several times I have waited over an hour to receive a test. The duplication between Salesforce campaigns and Pardot campaigns is absurd. If you're going to have separate campaigns just for Pardot, call them something else to avoid confusion. Reporting functionality is quite poor. If you have many processes built around Salesforce than it is probably the best marketing automation tool to use. However, if you're company is flexible than I highly recommend looking into HubSpot -- they are constantly improving their capabilities and releasing new featuers. They also have a much better UI, support team, and their template tool is crazy flexible as long as you're willing to learn HubL. I miss Hubspot very much. We use it for marketing automation, digital marketing tracking, emailing, form collection, and landing page design. We have built many successful digital marketing campaigns using Pardot. "Sophisticated tool to power your marketing efforts"
Pardot allows us to seamlessly connect our marketing efforts with our Salesforce CRM, which is utilized across a good portion of our company. Pardot is our go-to destination for our demand and lead generation, from email campaigns, dedicated landing pages, automated email flows, and more. Pardot is a complex tool. While it is organized well from a structural perspective, there are several redundancies (multiple email and form types, which do have a purpose) and a few limitations (in-depth A/B testing in Engagement Studio. etc.). Pardot allows us to easily connect with our customers and prospective customers and do so in an efficient and sophisticated manner. As we continue to utilize Pardot, we continue to develop our marketing platform and make smarter decisions, more efficient marketing strategies, and maintain a synchronized prospect, lead, and customer database in collaboration with Salesforce. Simply put, it makes marketing easier for us. "Dated Technology in Need of an Overhaul"
The only thing Pardot has going for it is the ability to connect and sync with Salesforce. That's not saying much. • Images in e-Mails do not display in Outlook 365 when sending tests. • Tracking e-Mail opens, CTRs, and other statistics are cumbersome to find on the platform. • No robust reporting or summaries for your e-Mail campaigns. • Working in Pardot becomes repetitive and clutters your org if you have multiple things going on, even when using folders and tagging. Campaign > Form > Completion Actions > Landing Page > rinse and repeat. Look into more advanced solutions such as Marketo. We have been using Pardot to capture e-Mail addresses from white paper downloads, trade shows, etc. We use the lead scoring and grading criteria to pass leads to our SF org. "Great product, needs a revamped interface and feature updates." Great integration with Salesforce and great for nurture programs. Easy to learn and use as well. Salesforce, in general, has great training and certification programs. Very limiting when it comes to email template design and setup. I've used HubSpot in the past, and I definitely enjoy how easy it is to set up a design, metadata, etc. with HubSpot. Pardot is not this seamless and sleek, very clunky to design with HTML. Pick your poison! Pardot is great with Salesforce and for those looking for advanced Salesforce reporting, but it not great for smaller teams looking to design and launch emails and landing pages quickly. We were looking for a marketing automation tool that integrated well with Pardot and provided us analytics for our SF instance, which Pardot helped us solve. But there was a downfall that we realized later on. Analytics sharing with B2B Analytics is not as easy and we thought, there must be a license to see analytics, which can get pricey. ""The potential outcomes with Pardot and Salesforce are truly difficult to beat""
I adore that you can integrate with custom articles which is basically opening up the API with the constrained out of the crate connectors Pardot has. This enables me to fabricate mechanization with our whole Marketing Stack. For whatever length of time that we can attach those things to Salesforce, I can utilize them in Pardot. I adore the scoring classes and the capacity to redo and alter the scoring. I cherish the custom sidetracks and the capacity to utilize those to follow commitment on channels that are hard to score, for example social, PR, online distributions, and so on. Move up of scores on the record level is incredible. The constraints with points of arrival are a touch of baffling on occasion, yet there are workarounds. I'd like to see a progressively hearty structure for ABM. I'd like the lifecycle reports and stages to be custom (I need to choose why something and how something turns into a "MQL"). While it's very simple to utilize, the power behind the stage is significantly more prominent when you have separate jobs delving into the device. For example a designer building custom greeting pages and email layouts, a promoting robotization authority fabricating the work processes and mechanization, and so on. An individual wearing each one of those caps is consummately able also. 1. Usability - My whole group can utilize Pardot they don't need to be designers or builds or even have an excess of involvement with mechanization. It's anything but difficult to learn and simple to execute. "Easy to Clean, Clean UI, Works Great with Salesforce"
It is easy to use and does not require much explanation. The UI is very clean and not overwhelming. Engagement studio has evolved quite nicely and allows for creating massive email campaigns with ease, just takes some time. The sync and custom properties to SF work nicely but could expand a little more. Not everything is mobile responsive out of the box, such as landing pages, emails, and so on. They don't have predefined parameters for mobile either. The drag and drop features are nice, but unless you know html and css your emails, landing pages and forms will look basic and boring. They do not offer pre-made clean cut landing pages like HubSpot does. Pardot is an expensive option, so weigh everything out. Overall, its easy to use and provides a great marketing automation tool. Make sure your admin user or product leader has a marketing background and wants to learn this product. "Pardot took our marketing efforts to new levels of success"
We like the fact that there is complete flexibility to go try out different marketing ideas and keep it all in house. We tried using several different marketing companies but ended up spending a lot of money and never getting the results we wanted. We found bringing it 'in house' and deploying Pardot was the best option for us so we can keep innovating and changing it up. The 'stock' landing pages can look a little 'home made' but they are great to get you going. Once you master them and get more ideas using them it's not a big leap to get a developer to help take them to the next level. We get a lot of inbound leads on a daily basis so being able to combine the power of Salesforce and a marketing engine in one is huge for us. It enables us to keep re-engaging with prospective clients like never before and turn dead leads into live clients all the while continually marketing to new leads as well. "Pardot is not just a sales tool - it's an effective tool for coaching!" It's very user friendly, my sales associates do not have to be super technically savvy to use and understand it. As a sales coach, I use Pardot to show my associates the effectiveness of their email campaigns. Some send too many emails, and some don't send enough. By using Pardot in conjunction with a call recording tool, we can evaluate better if they are relying too heavily on email and not using best sales practices. Ease of use, intuitive design, excellent (and abundant) reporting features, several tiers of customer support and a thorough knowledge base, communicates incredibly well with Salesforce (naturally) and is chock-full of helpful and user-friendly templates and creation wizards that make each element flow unto each other, all with a set of very prudent organizational tools! I think there are some inefficiencies as it relates to video. You can't set automation rules for videos. While wistia is part of Pardot, I think there could be more flexibility to incorporate video into drop campaigns etc. I run into a lot of issues not because Pardot is a bad tool, but because I do so much with Pardot that I have very high expectations of how quickly or seamlessly something should work. In these cases, I wish Pardot Support was easier for me to contact. Open cases seem to have been removed from the website and I'm not often using Pardot during live chat hours. Pardot helps bridge the gap between sales initiatives and marketing plans. Because it's tied with Salesforce, the sales team and marketing team all use the same data, meaning less gets lost in translation. "Great marketing automation, but not easy to use." From its Exact Target roots, the email marketing capabilities are what I like the best about Pardot. I have full HTML control and can easily create my own templates, A/B test, use variable tags, view reports, and more. The use of Litmus email previews is awesome too. I've been using the new SF Lighting UI for a while now and I like it a lot better. There were a few bugs at the beginning, but I thin they are all cleaned up now. The folder organization is probably a feature that doesn't get talked about much, but it helps a lot. We were told to try to use them and much as possible during the initial Pardot setup, and I'm so glad we did because you'll notice content and files start piling up immediately and having a solid folder structure makes life a lot easier. I've used a few other Marketing Automation tools before and Pardot is my favorite. It's simple, but robust enough to handle advanced needs. My major complaint with Pardot really has been with the UI/UX. The user experience is not great. It's not intuitive AT ALL. There are many instances where the interface breaks standard functionality conventions, leaving you in the dark trying to figure out how to do even simple tasks. That being said, the Engagement Studio has completely different UI than the rest of the app, and is actually quite a good experience. I guess Salseforce is taking their time redoing the rest of the app, but I'm sure they'll get around to it soon enough. The ability to sync Pardot communications to Salesforce campaigns is a great feature our sales team uses. I was using Hubspot before I switched over to Pardot. The best thing about the change was the incredible integration with Google Adwords. It was able to completely integrate with Adwords and helped give advice for better ways to improve. Lead Deck Pardot's Lead Deck gives you real-time activity updates of prospect's activity. If a prospect visits your services page, you can receive an update on your screen, and send them an email in one-click. Total visibility over user journeys, simple templating, full customisation and more - Pardot is a software power tool. Drip campaigns are customisable to an extent that I've not fully tapped into, and it syncs so easily with our advertising data. Limitations within automation rules for mutli-variable updates. For example - Loading a tradeshow list with campaign member statuses in SFDC. I would like to upload in one automation rule to say if X campaign status, update to this campaign in SFDC for X status, within the same rule I would like to add all of the other statuses with specific completion actions instead of having to run 1 rule for each status. Dynamic content should be able to trigger via a URL parameter and not just a known prospect field. We appreciate the seamless integration of Pardot with Salesforce, especially moving between Salesforce and Pardot, as well as our lead conversion processes at times. It has been helpful in generating leads via email drip programs and in getting more data on the visitors to our site and their activity there. "Standard Marketing Automation with Advanced Email and Content Tools"
It helps me in implementing email marketing with an older database as I get to learn what types of subject lines and templates work best with our segmentation of customers. ""Extraordinary highlights for advertising computerization""
The various scoring classes, rehashing support programs, and the new Connected Campaigns to get all the more detailing straightforwardly on the Campaign page, directly in Salesforce where you need it. Including the B2B Marketing Analytics device to the mid-and best dimension bundles was an extraordinary move. That is the announcing power that my customers need today. Also, that device keeps running on the Einstein motor, so it is the most dominant announcing accessible for Pardot. The underlying evaluating restricting you to 10k emailable prospects, and after that expecting to purchase extra contact squares. I might want more database seats accessible to begin. Need all the more Landing Pages that a non-coder can tweak. Different stages have simplified style presentation page developers, that is absent. Additionally A/B testing points of arrival isn't simple, when all progressions must be coded with HTML in the layouts. The highlights that Pardot has make it the best instrument I have utilized for promoting. It coordinates with Salesforce consistently, making your supporting all the more dominant and your business exceed all the more dominant. Content showcasing is made simple with Pardot frames gating the substance, Scoring Categories consequently distinguishing what my prospects are hoping to purchase from me, naturally bolstering the prospects into Nurture programs with Engagement Studio, and huge amounts of detailing en route with Salesforce. Every one of my messages are effectively redone to my marking. Pardot is one the easiest marketing automation systems you can learn. In less than an hour, I was able to setup Pardot to sync with Salesforce, build out a landing page and create an email campaign. The tagging functionality makes it easy to manage emails and related landing pages. Form Handlers is a great way to integrate Pardot with your website allowing you to use your own forms. The custom redirects feature is a great tool to create triggers and actions to link SMS and social media to your email campaigns. Pardot has addressed most issues in the later releases, but it would be nice to be able to manage multiple instances under one user account as some other enterprise solutions offer. Review all the functionality first to determine how Pardot will best serve your marketing or sales goals. Pardot is a great solution for our SMB clients who need an email solution, marketing automation and plan to use Salesforce as their CRM. The stage is adaptable in its usefulness and has a basic UI. Learning the stage is simple, particularly on the off chance that you have any involvement with advertising computerization experience. Most issues can be unraveled by glancing through their broad information base. Refreshing various points of arrival at the layout level spares time and monotony. Lead scoring is likewise made simple through finish activities and general lead scoring rules. When one of those standards is refreshed, the database will refresh chronicled records so you are contrasting one type with it's logical counterpart and not making a scoring separate. The new commitment studio make entangled trickle crusades simple to make and picture. The email creation/layouts can be somewhat surrey now and again. Lead task reports are useful, yet don't demonstrate when a prospect is doled out to a line, they show up as though they are unowned. No multi-battle attribution or record information synchronize from SFDC. Promoting is certainly not a solitary point attribution, so this usefulness is required. Contrast center usefulness with Act-On and Marketo then decide value focuses. Pardot has a characteristic favorable position as they are claimed by SFDC, and is less expensive than Marketo. In general I am content with Pardot, yet need them to push through upgraded highlights that come standard with different projects. Fragmented computerized messages, lead scoring, lead assignments, lead gathering and attribution have expanded the profitability of the showcasing and deals groups. The measure of work the framework does on a programmed premise would require something like 2 extra showcasing representatives. We have focused on commitment with an ever increasing number of prospects, expanding our change rates through a few portions of the pipe. Utilizing for promoting efforts including email, points of arrival, social. We could computerize a ton of support crusades immediately and start covering victories. It was extremely simple to set up mechanized crusades that used to require a great deal of planning and information divisions in our old framework. Time to showcase enhanced radically to arrive pages and messages. "Great UI and Salesforce Integration, but the rest is severely lacking. " The UI is very intuitive and user friendly, and the Salesforce integration is probably the best out there. This section far outweighs the above. To start you need to also have several other 3rd party products to create a full marketing suite. There is absolutely no way to create aesthetic landing pages inside of Pardot, you'll need to bring in another technology to create those. With the email templates there is a slight improvement but it is still an ancient editor that will limit even the most creative marketer. We upload via Pardot, use the form hadlers to integrate with the forms we create on our landing pages (because as mentioned above, the Pardot landing pages themselves are severely limited). "Pardot Needs to Rise to the Level of Salesforce"
I like that it's written into the Salesforce contract which makes it easy to be sold to exec managers for approval. I dislike that it's written into the contract because it's an unfair advantage to other platforms that should be considered. The platform itself doesn't live up to the Salesforce name - it's not flexible - it doesn't allow for great segmentation and it doesn't allow for great nurturing with flexible features that we're used to seeing from a platform like Marketo or Eloqua. It needs to rise up to that level. Make the product more flexible and allow marketers to drag and drop similar to marketo - for easy of use in building nurture programs. have everything sit in one view vs. having to build lists in one view and then set up emails in another. We are capturing data on folks interested in our services and are able to help score them and prioritize them for sales. This is standard protocol for B2B companies. "Driving engagement with Salesforce Pardot"
I have been using pardot to keep industry analyst community up to date with the key highlights happening in the organisation. The best thing about it is that I exactly know how we are engaging with the community and how they are responding. I cannot upload multiple lists in one go and add them in a separate list. I have to do it individually. If anyone wants to nurture leads, engage with their audience, score leads, I would recommend Pardot as an excellent to achieve that objective. To have a increased mind share about the organisation in the analyst community. With the email campaign, I have seen higher awareness amongst the selected audience. "the tool to automate marketing"
pardot is a fundamental tool when it comes to automate marketing, what I like about this is that it allows to be integrated into the email and be able to market various products in this way, it is interactive since the customers themselves can mark a product route as they are quantities, modifications, among others. This question is very important because it generates a closer approach to the client giving confidence and security to buy the products you want convenient for yourself. The only thing that could change pardot is that it is integrated with google analytics and google adwords that are tools that are sometimes a bit difficult to use, so I have worked very little with them since it is displeasing to serve these google applications, without However, it does not work badly and leaves its marketing functions in good condition. pardot is the best tool for marketing, you use the best marketing strategies and customization of your interface quickly and safely, once it adapts and does not stop using. If you have an innovative company to increase your sales use this application. already using a tool that allows you to increase your sales force and automate these processes through the use of software is already beneficial for you, imagine if in addition to this you add that you attract more customers for electronic mail promotions, in addition its interface allows you to fully customize the application with just a few configurations. also is interactive with customers allowing a forum of ideas where they leave their comments and we can see to see if they got a problem that can be solved. The amount of data and possibilities with the date is great. We can really optimize our campagnes in just Pardot. Besides data, we are happy with the engagement studio and drip campaigns. The mail and landingpage editor is not user friendly. You still need experience with html and css to make a great looking email of landing page. This should be more user friendly in a front end developer (drag and drop). Especially if you target Pardot to small and medium businesses. For implementing Pardot we advise to talk to a Pardot Partner. The setup isnt easy nor is it easy to see all the posibilities of Pardot beforehand. Know what your targets are and see of a tool like Pardot can help achieving those goals. Thats why I advice to speak with experts before trying out a trial of even purchasing the product. Touching our prospects at the right time with the right content. With the data we have in Pardot we now can meassure what works and what not so we can optimize our campaigns. "Scalable marketing automation for medium-large organizations"
The UI is friendly and intuitive enough for most marketers to pick up the tool fast, but the advanced tool sets also allow for marketing campaigns to dig deeper than they would on other "easy to use" tools. Pardot brings together many digital marketing features and reporting tools that are necessary for a growing marketing department. The platform allows for the organizations to scale with the product as they grow. There are still integration limitations with Salesforce and a lack of integration with other marketing tools. For example, the only event platform that has a verified connector/integration with Pardot is Eventbrite. Hire an admin. Spend budget on training employees. Work with a consultant. Invest in the platform! We are able to find and engage with qualified prospects more quickly. We have found many clients this way. We have also saved time using the automation tools within Pardot, making our internal and external marketing communications more efficient. "Really robust functionality - Sort of a steep learning curve"
There's a lot of functionality and there are some built-in automatic things - for example, it converts my HTML email to text with one click. The WYSIWYG editor is nice, but could be easier. The general navigation has some steep learning curves. Some things aren't as easy to find as one would hope. It should be easier to find my folders. You'll get the most out of it if you connect it with good contact data in Salesforce. I use Pardot to send emails to customers before major tradeshows to let them know we'll be there, and to entice them to come visit our booth. I also send them to leads collected at those events for follow-up. "Pardot is good for businesses, not amazing at design"
The integration with SF contacts/lists is a great standard that makes sure your information, lists, contacts, etc. is all integrated and up to date. I will say the tracking and metrics provided after each email send are exceptional. I do wish there were a way to choose the graph (instead of it being just clicks). The technology or deep details are very hard to figure out. If you cannot code, you will have a hard time figuring out how to get a true marketing campaign going. If you want to use this as 'just' email with no real call to actions behind it, it's the perfect tool for you. Have your templates, landing pages, forms, etc. designed by those who technically can dig around Pardot/SF. If you piecemeal something together, it will look like it with Pardot. We have consistent campaigns going to customers and prospects using SF verified data that is tracked. "Pardot's marketing email automation saves us time and money. " Once you have Pardot set up with lists and email templates, you can utilize the tool to automatically send emails via different rules and schedules. Without Pardot, we would have to hire a full time email marketer to complete half the amount of work that Pardot does for us on a daily basis. If you send out marketing or announcement emails to prospects and customers in a B2B environment, then I highly recommend this product. Pardot's AB testing, analytics reports, and form tracking keep our emails targeted and increase our ROI. In the platform you have both Drafts and Templates, I don't understand why Pardot didn't combine the two. This can make finding created emails tedious, as well as, cause you to create duplicate email templates. Lastly, as with any Salesforce owned product(s), you are charged based on tiered storage, so managing your contact lists, artwork, and email templates are essential so you don't go over your data limit. As previously mentioned, Pardot does a ton of work for us. We run personalized drip campaigns that sync to Salesforce which allow prospects and customers to receive an up-to-date stream of content, keeping our company and product top of mind. Furthermore, we track product demo requests and training webinars by using Pardot forms. Doing this is extremely beneficial, as we are able to automate data and tasks into Salesforce for our sales and customer success teams. "Powerful tool that needs a serious UI refresh"
There's a lot of power behind the automations in Pardot, and its model of building lead lifecycles works for nurturing prospective leads into customers. For a niche market it works really well, and its focus on leads instead of transactions or conversions puts it apart from other broader systems. But the UI of the tool looks crusty and outdated, and doesn't provide much in the way of guidance, nor does it use any kind of ML or AI to surface common tasks and guide you through a workflow. Its model is a little out of date for today, especially looking at leads from the perspective of a funnel. Inbound marketers who are up to date know that we're moving away from funnels and toward models like HubSpot's flywheel. I think there are some better and more robust solutions out there, foremost of which is HubSpot. Pardot is for a very narrow audience and at this point it's a little outdated. Building email marketing automations is the goal in Pardot. I don't think I have got much benefit out of it yet, but my team is working on it. I expect that due to this software's complexity and its difficult to navigate UI, most people won't be making full use of all of its tools. Basic automations are good but there needs to be deeper hooks into other systems to draw out information and insights that can help to personalize future email campaigns. "Almost Everything I Need for Email Marketing Initiatives"
I like the structure, ease of use, and the variable functionality of the automation software system. I like that I still have access to the full HTML body in their builder software, but also can design visually or with partial HTML/CSS if necessary. I like the statistics we get from sent e-mails. Landing pages are easy to create in Dreamweaver and port over to Pardot. I don't like that I can't better export contacts' tag, list, etc. information in order to better sort out direct marketing from our business development staff. Tags are technically included with prospect exports, but are in a single cell delineated by commas, which can be cumbersome with thousands of contacts in an export. I would like to be able to automate based on e-mail drafts rather than create an absolute deluge of templates for a single campaign that can't be sorted well when choosing a draft e-mail to send which isn't automated. Make sure to automate your incoming SalesForce contacts to Pardot (they will show you how during onboarding) and we've found that creating a custom "salutation" field helps when creating variable data personalized e-mails (i.e., Mr., Ms., Dr.). Nearly our entire digital marketing platform is based around Pardot marketing initiatives. We have designed our site to better reflect Pardot capabilities, used Pardot redirects, landing pages, embeded forms, etc. in order to better track incoming prospects, and have been able to strategically focus on a core audience for direct business development rather than just cold-calling. As a result, we saw a 170% increase in our proposals submitted vs. closed sales in 2018, which was huge. "Easy, Intuitive Dashboard. Logical user interface. " I have several user who had zero previous experience with automated marketing tools. These "rookies" followed the intuitive user interface to create marketing campaigns in minutes. Easy to use and logical. Got up and running quickly. A couple of quirks, like reminding yourself to empty the trash because it "counts" as your data limits, but for the most part, not much I don't like. There are tons of products out there that are good. I wouldn't say Pardot is better than Marketo or others, but my experience has been smooth. Our company had never been in the marketing automation game, so this was a user friendly entry into this world. Salesforce does a nice job with tutorials, but we hardly referenced those since the tool was so intuitive. "Engage Leads + Clients Like A Pro"
Pardot closes the reporting loop for us in Salesforce (Sales Cloud). We can automate marketing ROI reporting as well as view our Customer Life Cycle. Overall it is a power system, easy to use with a great deal of resources available and fantastic support. The out of the box templates are dated, so to make your emails + forms look modern you require a lot of HTML + CSS knowledge. I can't believe Salesforce Engage is a paid extra and not a bonus if you're using both Sales Cloud + Pardot together (even x1 free license would have been nice). Perfect for niche industries with long and complex sales cycles. Before you buy, make sure you plan ahead first, don't rush into getting it and spending a month+ working things out. Attend several events and watch the videos online. Identify your measures of success and then see if Pardot can actually do it. It's a powerful system but not perfect. The salespeople are great and will answer your questions, so don't be afraid to be frank and ask lots of them. Problem 1 = dated / inefficient marketing, sales, customer service practices. With Pardot we've streamlined how we communicate to our prospects + clients. Marketing can now communicate to segmented buyer personas. Sales only talk to qualified leads that have been nurtured and are ready to buy. Customer success teams engage on a deeper and more meaningful level with our VIPs. "Pardot, making email campaigns a breeze!" I like the reporting and segmentation lists bets. It's VERY easy to see how each of my email campaigns are doing and even easier to dig deeper into the lists, if I want to. There are a lot of options within Pardot. I know they all have functionality, but I find it confusing that there are so many level to dive into. If you need a system to help with your lead nurturing or email campaigns - this is a great product! Pardot allows an easy use to use a template already created or customize your own. You are also able to creating landing pages and registration links - is an all-in-one platform for email campaigns! We're solving for an ease-of-use platform to send mass email campaigns, without emails "disappearing" as we find with other platforms. We've realized the reliability of Pardot with the send and we're really enjoying being able to send the exact status of the send to account managers. "Great for understanding a prospect"
The thing I like most from Pardot is the ability to see how my prospects interact with emails and our website. It really lets me know the potential of the prospect. Lead scoring is also another great feature that can really let you understand someone who is close to buying based on traffic. I also like the synergy with SF and task creation based on things happening. For example, if someone downloads a whitepaper I get a task to call them immediately. The biggest thing I dislike as a user is I don't really have permission to see all that I'd want. There are a lot of restrictions to user rules and from my understanding, not an ability to customize what those are. This would make it easier for me to get the detailed reports I 'd want but currently, I wait for an Admin to send to me. I think this is a very "next level" tool a lot of the basics you can do from Mailchimp or even Constant Contact. So if you're not ready for the big leagues yet take the time to make sure it's what you need and avoid making 2 software changes. Pardot is taking our email marketing and web traffic to a new level. We are able to better qualify leads faster. It makes it very easy to see an activity history and to know if someone "scores up" to call immediately. We also use a lot of task generation based on certain things that happen. * We monitor all Pardot reviews to prevent fraudulent reviews and keep review quality high. We do not post reviews by company employees or direct competitors. Validated reviews require the user to submit a screenshot of the product containing their user ID, in order to verify a user is an actual user of the product. Hi there! Are you looking to implement a solution like Pardot?